There is every indication that Europe is entering a more severe phase of its sovereign debt woes. A new crisis is unfolding despite Herculean efforts by the European Union, the International Monetary Fund, and the U.S. Federal Reserve. In May, Eurozone members and the IMF gave Greece a $143 billion bailout. Last month, Ireland was given a $113 billion lifeline to mostly cover losses from its two largest banks. The market now fears that Portugal, Spain, Italy, Belgium, and the UK will need rescue packages to cover their debts. The EU has already created a $700 billion rescue fund for all debt problems, so a bailout of Portugal can be managed. Spain is the nation that has analysts and investors worried. It has the fourth-largest economy in the EU, and it would need at least a $500 billion bailout. Of course, this would require Europeans to revise their rescue fund. The lockup of the debt market may force the EU to act. Spanish banks will need to refinance about $111 billion in debt next year, and money managers have suddenly lost their appetite for bank debt. In November, Spain’s financial companies sold $390 million of bonds in Europe. This compares with $3.08 billion in the same period a year earlier. Bailing out an EU member is no guarantee that it won’t later get back in line for another handout. Greece, which the authorities thought was largely cured, has suffered a relapse. Its economy is in freefall, and the debt-to-GDP ratio was increased from 11 to 13 percent. The default swaps - insurance-like contracts for bonds - are now double what they were before the nation's first bailout. All these bailouts may eventually put Germany at risk of default. The Germans are the most industrialized members of the EU, and they are rapidly growing tired of having to help finance a rescue plan for another one of their deadbeat neighbors every few months. Last week, a new law forced the Federal Reserve to admit that it had loaned out a vast amount of money to European Banks. In total, the Fed had promised what equaled a staggering $9 trillion. Many on Wall Street were impressed that the Fed was able to write hot checks for such a large amount, but it meant that the Fed was forced to make a life-or-death gamble with the world’s financial system. 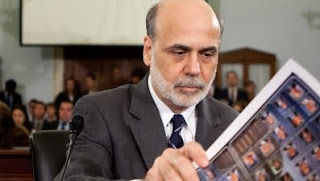 If we suffer round two, Fed chief Ben Bernanke will probably make another all-or-nothing gamble. One of the best barometers of our ability to contain the sovereign debt bubble is the performance of U.S. ten-year bond. Because the dollar is the world reserve currency, international traders run to the ten-year note during times of trouble. They typically bid up the price and drive down the yield. In the past few weeks, the ten-year has lost some of its safe haven role. Despite the Federal Reserve's continuing plan to buy $100 billion of bonds each month, rates have still been rising. When word slipped out that Uncle Sam might be asked to chip into a larger IMF bailout fund for Europe, the ten-year plunged in value. The rate on the ten-year is now above 3 percent, and economists are very worried about it going any higher. Because the U.S. has such a massive debt, we need to maintain low interest rates. If rates rose to 5 percent, it would double the size of our interest payment, which would result in a $2 trillion annual deficit. If rates went to 8 percent, we would have a $3-trillion-dollar shortfall. The debt-domino nations will certainly continue to fall. The question here is what impact they will have on Bible prophecy. As the situation becomes unmanageable, we may see several nations get kicked out of or leave the EU. Since there are currently twenty-seven member states, a major realignment would need to occur to reach the ten members predicted by Daniel and John the revelator.